Upselling and cross-selling techniques can maximize the benefit of both customers and online business owners. Forbes has mentioned these selling tactics for helping Amazon boost the revenue up to 35%. I believe this number has gone up so far. Wondering how to boost your online store’s revenue up like Amazon? The reality is that acquiring new visitors costs you a lot of money and efforts. It means for better ROI, you should increase your average order value as much as you can. Thus, the real question is how to make people spend more on each order? And in this post, we are going to show you how upselling and cross-selling can solve this question and help your online store grows to the moon. Do upselling and cross-selling techniques really matter? Did you know that the eCommerce conversion rate is just about 3%. It means with 100 visitors, probably 3 people will turn into your customers. Thus, you should care about increasing the customer lifetime value by using upselling and cross-selling techniques. With a focus on assisting your shoppers like a virtual salesperson, this selling strategy is giving your customers a chance to win something from your online shop. Everyone loves the winning feeling, it makes them happy. And, happy customers are the ones who would be willing to spend more. Amazon is always the best example of using upsell and cross-sell to boost the revenue up. 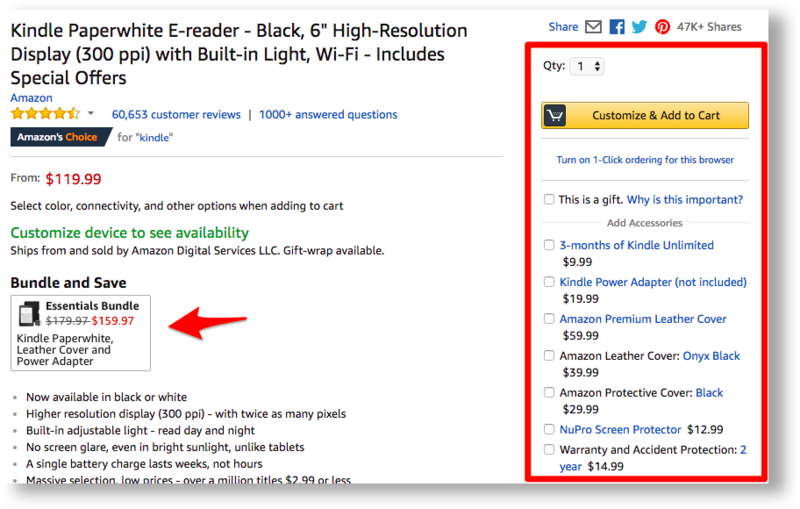 As you can see in the image above, when I am browsing the Kindle Paperwhite product page, Amazon suggests me to upgrade my choice by buying the bundle at a better price. The feeling of saving money will encourage me to buy it. 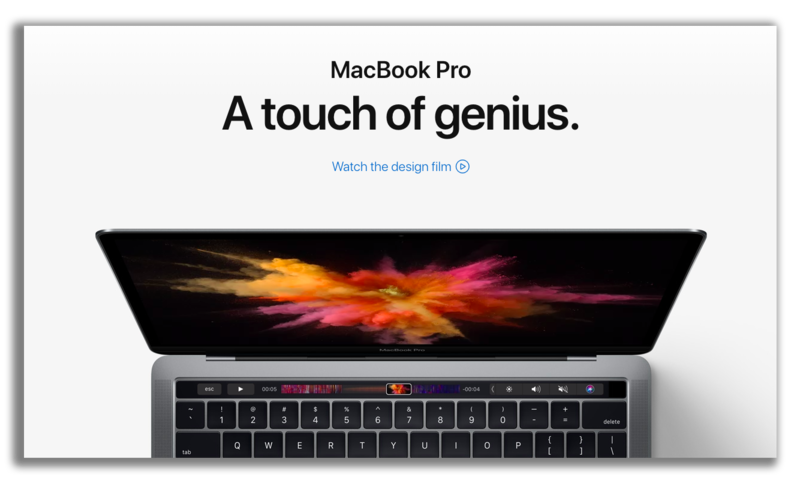 Moreover, no problem if shoppers don’t want everything in the bundle, Amazon offers the customize function that enables buyers to choose what they want. Another way to make people spend more in a second. Here’s another example about Amazon’s cross-sell. When I check a drill, Amazon AI (artificial intelligence) with their data knows what I need and deliver me this “Customers who bought this item also bought”. Just a simple sentence and a little social proof, shoppers will be convinced to take a look at them and buy more. How awesome it is! To grow your eCommerce store, try to apply these techniques. You can employ your own “bought this also bought” block with the Personalized Recommendation app. This app will automatically recommend right products to your customers based on their browsing history or products added to their carts. One more example comes from a big eCommerce business. Best Buy has many products on its website and they packaged items into a bundle to sell just like what Amazon does. Tip: Create a bundle that benefits your customers and enable them to customize their own that suits their needs and budget. Here’s another example from Best Buy. 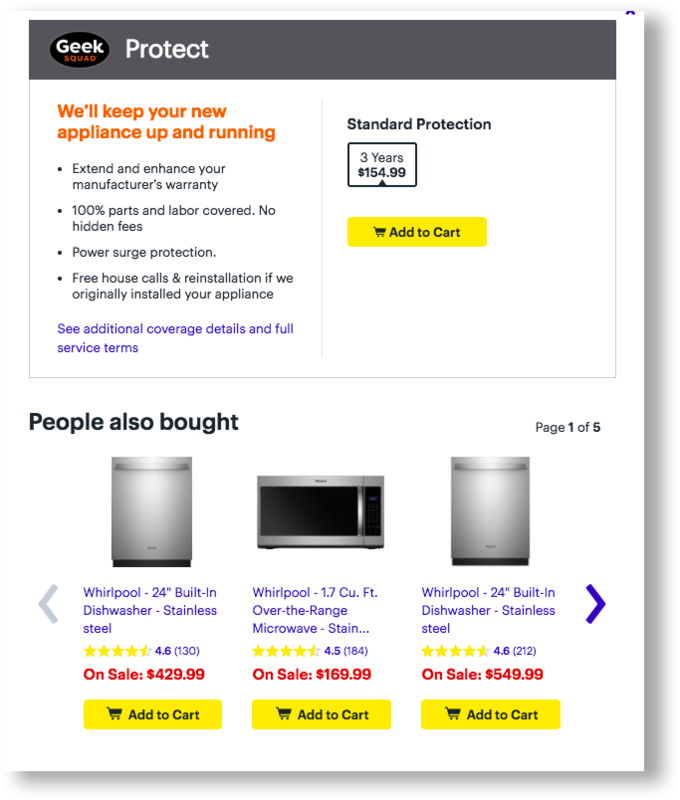 After people adding an item to the cart, a popup will show up promoting for some “on sale” products, it’s a good way to cross-sell other items. To apply all of these upselling and cross-selling techniques to your online store, try Boost Sales which allows you to bundle up your products and create your own upselling and cross-selling strategy. This app definitely can help you to create best upsell and cross-sell offers that can convert. The most common way to of products cross-selling is suggesting people buy other products. 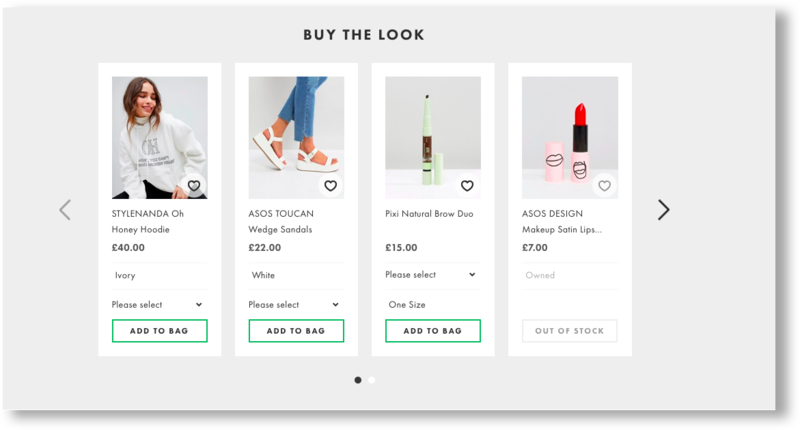 In this example, Asos uses “Buy the look” trick to encourage shoppers to buy more to get a perfect look with the original product. Not only you are giving your shoppers some suggestions for their outfit ideas as a helper but also encourage them to buy the whole things in this look. Another way to apply this upselling and cross-selling technique is offering the supplementary products to your customers. Supplementary products are two or more items that have to use together. 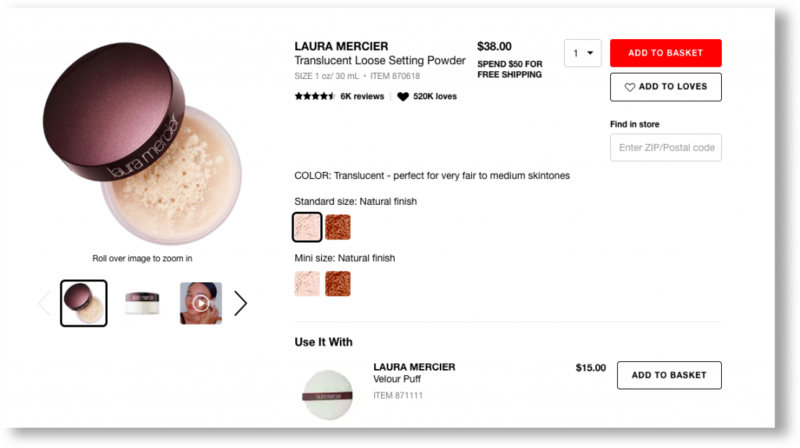 For examples, take a look at Sephora, when I visit a beauty powder product page, there is a “use it with” block which shows me a sponge to use with this powder. A simple and easy way to convince me to add this sponge to my cart. The result is, I spent $15 more on Sephora. This is exactly how an one click upsell increases the profit for a ton of online stores. What should you care when applying upselling and cross-selling techniques? There are so many ways to do upsell and cross-sell but there is nothing called the best way. It’s all depends on your business model and your audience. But at least, I want to give you some things you should notice when building your own upsell and cross-sell strategy. This strategy is not just about how to increase sales, but also about how you treat your online shoppers. Thus, don’t offer them the irrelevant products. Your potential customers will be confused if they are looking for a healthy product and you keep trying to cross-sell them some fast foods. It’s weird! Take a deep research on your online store’s data such as sales history and build your own upselling and cross-selling strategy by making a bundle of what your customers frequently buy together. I know that this tactic is powerful and effective but never overuse it. Forcing your visitors again and again to see recommendation products is not a good idea. Let imagine that your customers are trying to purchase some products from your online store, but your checkout process still cross-sells other products again and again. How would they feel? It’s annoying. It feels like you are trying to take their money but not helping them. Your customers will leave your site and never come back. Therefore, in the checkout process of your online store, just offer the upselling and cross-selling deal one time. You know why the phrase “customers who bought this item also bought” works like hell? Because it’s the easy way to prove that other people buy these items and the shoppers should buy them too. And people love social proof. You can see that, most of the purchasing decisions are emotional. Choose the right words to touch customers’ feeling and you will be surprised with the result. There are some powerful words that can help your eCommerce store sells like a machine. Try to apply “free”, “save”, “encourage”,”you”, “your”, “people like you love these items”, etc to your site and wait for a magic happens. Try to analyze your online store’ data to understand your audience deeper, there are so much information you can use to upgrade your selling strategy. It’s the big advantage of eCommerce, use data analytics to grow your online business. Wonder why data analytics involve upselling and cross-selling? As I said above, with data analytics, you totally can bundle your items up in a package and sell it effectively. Moreover, with your data, you will know what bundle works best or what copy brings more sales for you. If you aren’t using this upselling and cross-selling tactic for your online store, you’re leaving money on the table. With good process, they not only increase your online sales but also make your shoppers happy. As an eCommerce store owner, making profit is always obviously important, but it’s even more in helping your shoppers achieve their goals. Do it naturally and your customers will spend much more than you think.